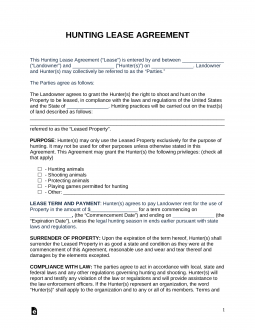 The Hunting Lease Agreement is an easy to use form which can be utilized to solidify a contract between a Landowner and Hunter. This template will supply both the Landowner and Hunter with the wording necessary to outline what the Hunter may do on the Landowner’s Property, when the Hunter may use the Property, and the Lease terms of the Agreement. It should be noted, once this agreement is signed and dated by both parties it will be considered a Lease Contract binding both parties to the terms it defines. A Hunting Lease agreement, is a binding legal agreement between two individuals (the lessor, and the lessee) for the purpose of hunting at one of the individuals’ (the lessor) land or private property. An individual can setup a Hunting Lease if they are interested in payment for utilization of their property. The individual must be the landowner of the property and the purpose of the agreement is to protect both the owner and the hunter(s). It will protect the owner by establishing that the hunter follow strict guidelines and regulations while hunting on their property. The agreement protects the hunter by providing him legal documentation that they are allowed to hunt on the private property. The agreement should detail out the duration of the lease, as it can be utilized for one day to several hunting seasons along with other potential requirements (i.e. no hunting on Saturdays, maximum hunters, price per hunter, hunting style, planting food plots, forfeiture clauses, etc.). Upon the document being signed by the lessor and the lessee, it will take immediate effect unless otherwise noted. A hunting license provides an individual the legal right to participate in sport or recreational hunting. A hunting license for an owner to hunt on their own land is not required. Individuals interested in hunting on private property or the tenants of a property being rented, may be required to obtain a license. Married couples must have both individuals listed on the property deed. In certain states, if a married individual is not listed on the deed they must acquire a license to hunt on their own land. The license should be reviewed for the particular animal that is stated, any animals not listed on the license cannot be hunted, even if the license holder is the landowner. For traveling hunters, keep in mind each state will also require its own hunting licenses or permits. The hunting license is required to be carried at the time of hunting. The individual can carry an electronic copy of the license or a physical copy. A hunting license can be valid from a calendar year, up to a lifetime, which is dependent on the state. Other documentation may be accepted, which is dependent on your local Department of Fish and Wildlife. The application must be submitted to your local Department of Fish and Wildlife alongside the appropriate payment. A Hunting Season is a particular time of the year in which a hunter can legally hunt animals. Open Season is referred to as the time that a specified animal, bird, wild fowl, or game animal can be legally hunted in accordance with local Department of Fish and Wildlife. Open Season can be narrowed down to a specific time of day and the length of time can vary from several weeks to several months. Open Season may also have a daily limit of animals that can be hunted. There can be multiple Open Seasons throughout the year for the same type of animal, due to the type of weapon (archery vs firearm) that can be utilized to hunt. Closed Season is the time of year that hunting is not permitted making it illegal and therefore can be punishable by law. Seasons are created to protect the animals during their most vulnerable time frame, protect peak mating season and population size. There is also an additional Limited Season that can be created by the Department of FIsh and Game in order to create tighter controls over animals hunted. Not hunting from the road. Tagging all animals as required. Hunting with the appropriate permit within private property. Documenting the gender of the animal. Lawful possession of a species. Hunting with the required license/documentation. Outdoor Safety Courses provide hunting education and safety requirements in the individual’s state of residence prior to obtaining their license. The course is not required for any hunters hunting with an individual who is directly supervising, who was born prior to September 1, 1969. The courses can cover knowledge, skills, attitude, hands on training, safe sporting practices, appropriate gear to use and proper technique. Upon completion of the course, the individual may utilize the certificate as certifiable proof in order to obtain a hunting license.